It was so hot again yesterday. I couldn't imagine cooking inside. 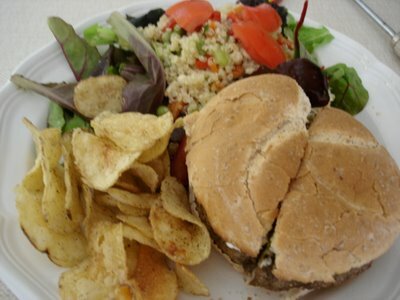 I took a quick trip to the No Frills and bought PC portabello mushroom burgers, Miss Vickies pepper lime chips and recycled the quinoa salad. Very satisfying. How do you like those burgers? My friend raves about them. I'm a Lick's girl and my husband likes the Oh Naturel! kind. Veggie burgers have to be one of my favorite summer dinners. We eat crazy amounts of them it seems. On the BBQ of course. Thanks for the reply on the noodles. I don't know what's happened in Burlington. It seems to be a desert for wide rice noodles. The vermicelli ones are everywhere, but that won't do for Pad Thai. I'm going to Whole Foods in Oakville on Sunday, so maybe I'll check out a No Frills or Loblaws in Oakville. I'll write that brand name down and see if I can find them. Thanks!! I *love* the portabello mushroom PC burgers! (They are not vegan though - they have swiss cheese in them). The PC best veggie burgers in the world are quite good too. We love the nature burgers as well - they have a nice spice to them. I think the best veggie burger in TO, though, can be found at Fresh for Life restaurant on Bloor Street. Man, those are good. I have the recipe, but I don't seem to be able to recreate them at home. I haven't tried Oh Nature!, will be on the lookout for those. Let me know if you run into trouble finding pad thai noodles. I can mail some to you if you like! LOL! to the article there is stationary a question as you did in the fall publication of this beg www.google.com/ie?as_q=nidesoft dvd to iphone converter 3.1.28 ?